Justin Trudeau keeps insisting the Trans-Mountain expansion will be built. But judging by his meetings this week with the country’s feuding NDP premiers, the prime minister now seems more comfortable with the one who’s not on his side. 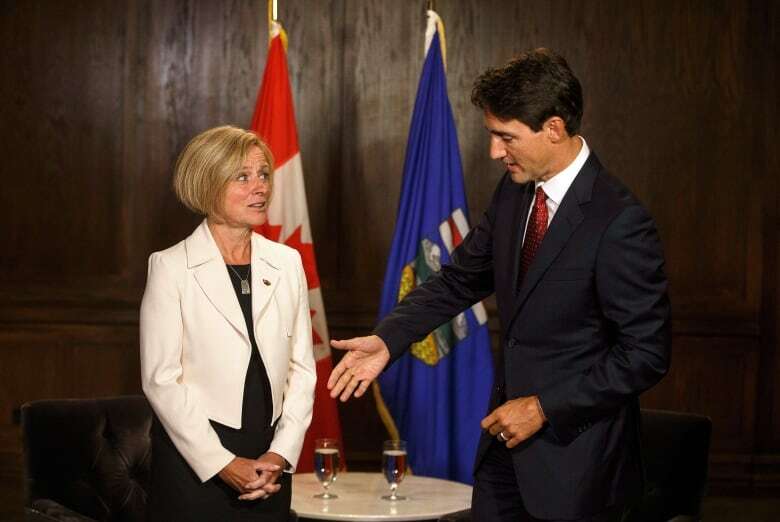 Once, Alberta Premier Rachel Notley was the PM's key regional ally. Things change. Justin Trudeau keeps insisting the Trans-Mountain expansion will be built. But judging by his recent meetings with the country's feuding NDP premiers, the prime minister now seems more comfortable with the one who's not on his side. Trudeau stopped in Vancouver and Edmonton this week for his first face-to-face meetings with B.C. 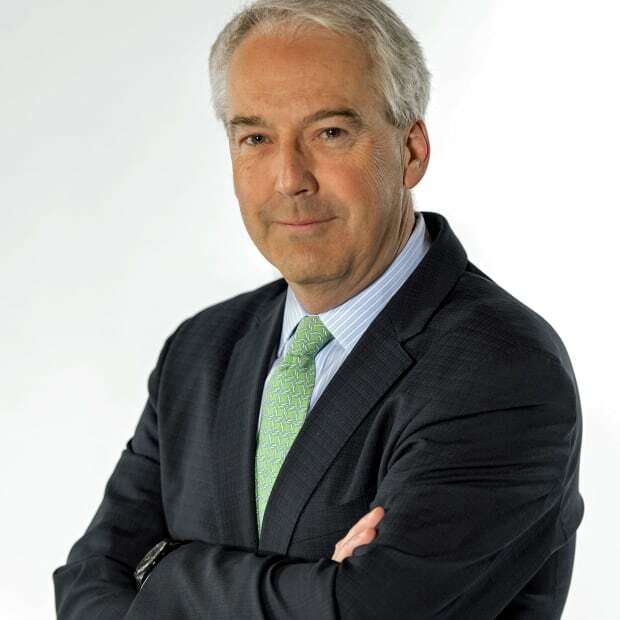 's John Horgan and Alberta's Rachel Notley since the Federal Court of Appeal ruling brought work on the pipeline to a halt almost before it began. The court said the federal government failed to adequately consult Indigenous Canadians about the project, and that the National Energy Board review was flawed because it didn't take into account the massive increase in tanker traffic off B.C. 's coast. The ruling was bad news for both Trudeau and Notley. 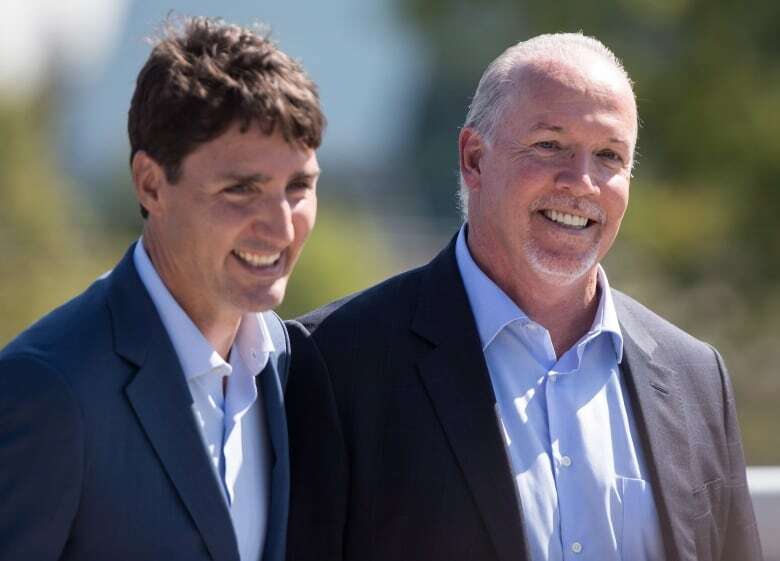 The two have been touting the economic importance of the project, which would triple the amount of bitumen shipped out of Alberta to Burnaby on the coast. Neither government, apparently, had considered the potential impact of the court ruling as it eventually did. Horgan, meanwhile, appears vindicated. His opposition to the project — his government's decision to file its own legal challenge — suddenly looks sure-footed. Horgan hasn't really had a moment like that since he accidentally knocked over his own water glass during a news conference with Trudeau in Ottawa last year, quipping that "spills can happen anywhere." He and Trudeau were not allies then. Perhaps they aren't now. But if they're still at loggerheads, that wasn't evident at all on Tuesday when the two re-announced financial support for a pair of major transit projects in the Vancouver area. They joked. They smiled. They talked about their common interests. Trudeau said he and Horgan had taken the Skytrain together to the press conference, using the commute to talk about their shared commitment to reducing traffic congestion and promoting B.C. 's Lower Mainland as an attractive destination for investment — "making life better for British Columbians," as Horgan put it. Neither leader dwelled on Trans Mountain. Neither mentioned B.C. 's legal challenge of the project while answering reporters' questions about the impact of last week's federal court ruling. 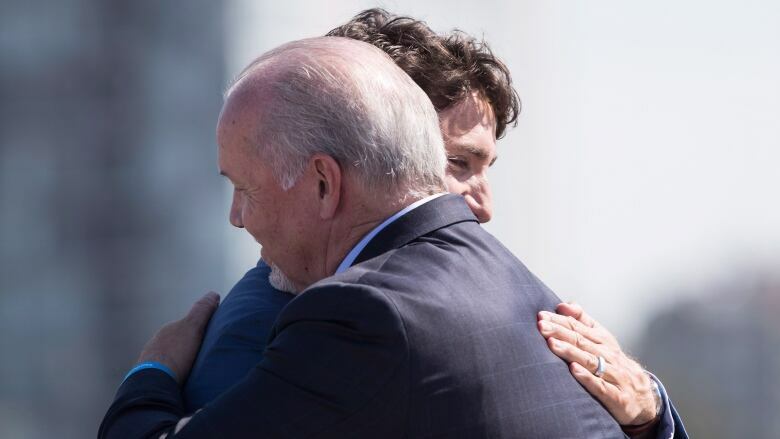 "The prime minister and I have been working together now for 14 months with different perspectives on this one issue," Horgan airily told reporters. "We continue to look across the mountains to work with our friends in Ottawa for support on the things we can agree on — which are very, very many, and the things we disagree on are very, very few." "Stay here," Trudeau said as Horgan moved away from the microphone. "There might be more questions." The two shared a good chuckle. Sources tell CBC News the buddy act didn't go unnoticed in Edmonton. Premier Notley's office also seemed surprised that Trudeau was going to be there the next day, and scrambled to arrange a time and place for the prime minister and the premier to meet. When they did, the tension in the room was palpable. There were no shared laughs. The two held a brief photo op before the meeting, which lasted barely an hour. Asked later how the meeting was, Notley's reply was terse: "It was." Notley's government has spent a lot of political currency on Trans Mountain. She agreed to join the pan-Canada climate change plan and to bring in a price on carbon. In return she wanted — and got — support from Trudeau to get the pipeline built. His government even stepped in this summer to buy the project from Kinder Morgan to ensure it went ahead. None of that now appears to matter. Notley remains a friend in need. Trudeau doesn't have much to offer as a friend "in deed." On Wednesday, the prime minister grimly recited the measures his government is considering to meet the court's call for more Indigenous consultation, and to ensure the additional tanker traffic won't have an adverse impact on killer whales off the B.C. coast. "Our goal is to get this pipeline built and in the right way," he said. Duane Bratt, a political science professor at Mount Royal University in Calgary, said the frost warning in the Trudeau-Notley relationship came a week ago, when Notley went on television to announce what he calls her new stand-up-to-Ottawa routine. "They were allies. They were very close allies," he says. "But with the court decision she needs someone to blame. She can't blame the courts. She can't blame Indigenous people on the B.C. coast. So she's blaming the prime minister." Bratt said Notley is in a tight spot — trailing in public opinion polls behind Jason Kenney and his United Conservative Party and having spent so much of her time in office on a project that's now unlikely to be built before next spring's provincial election. "I think it will still be built, but it won't be in time for her to get the credit," said Bratt. Trudeau's own election timeline isn't a whole lot longer. But Bratt said Trans-Mountain isn't going to have nearly the same impact on the prime minister's political fortunes — in Alberta and nationally — as it will on Notley's.